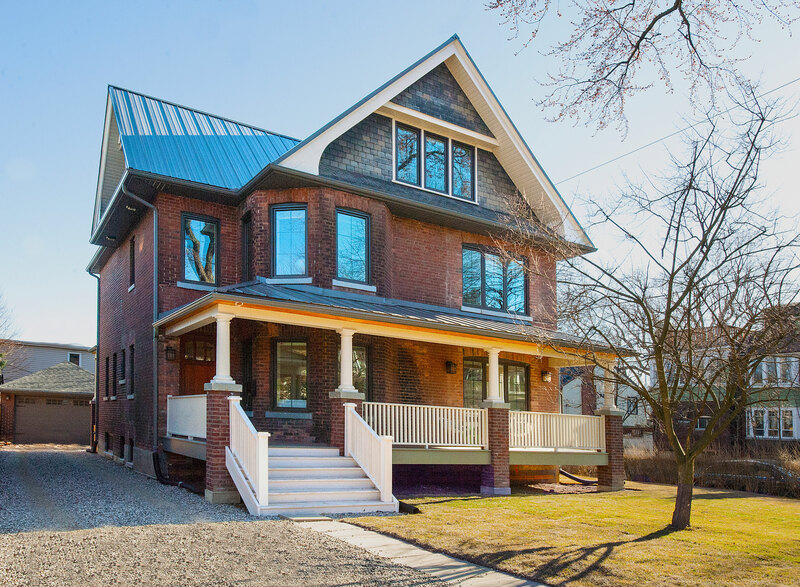 The major renovation of this original 1800s Toronto house, built by Equinox Developments, maintains the heritage quality of the exterior while updating the interior to a bright, contemporary home. 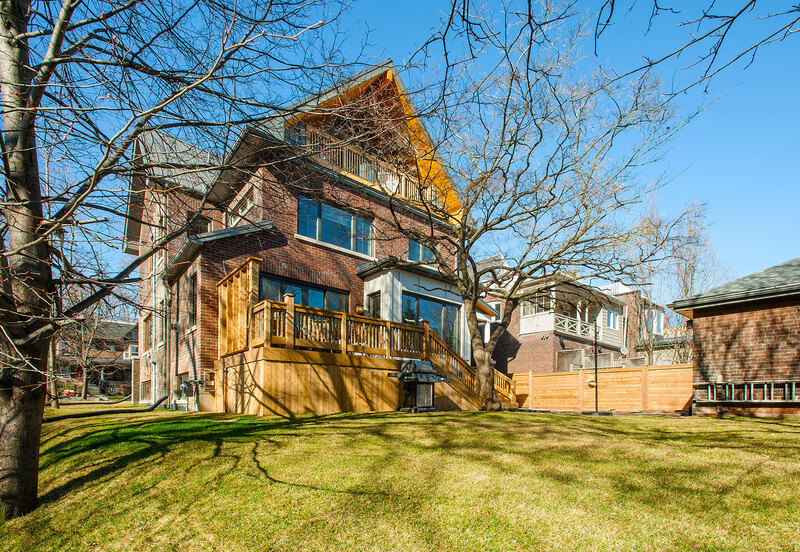 The house sits on a corner lot, with a beautiful southern view of the downtown from the backyard and rear of the house. 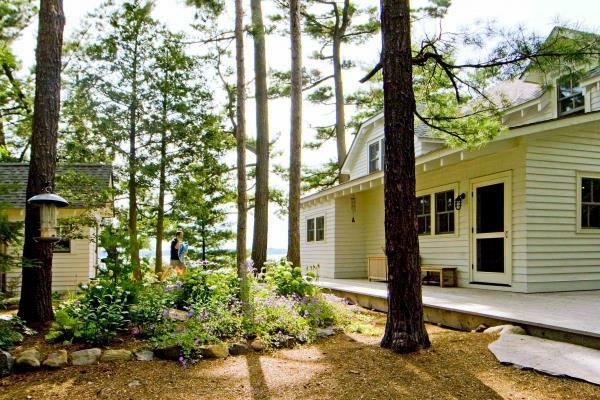 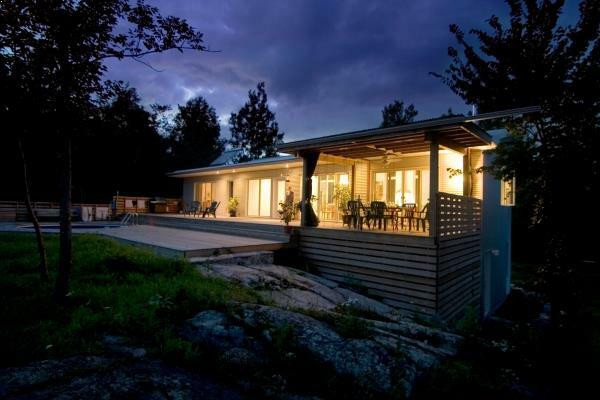 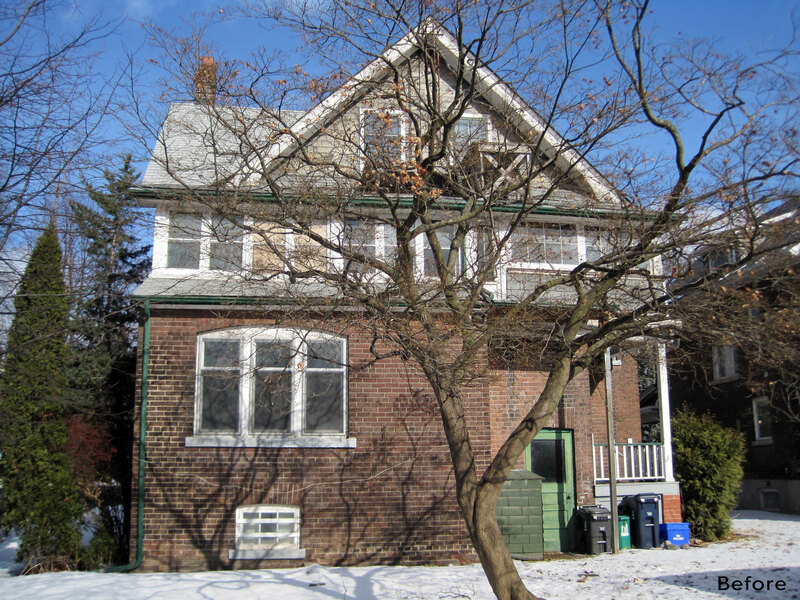 The existing home was deteriorating, and had not been renovated or updated for many years. 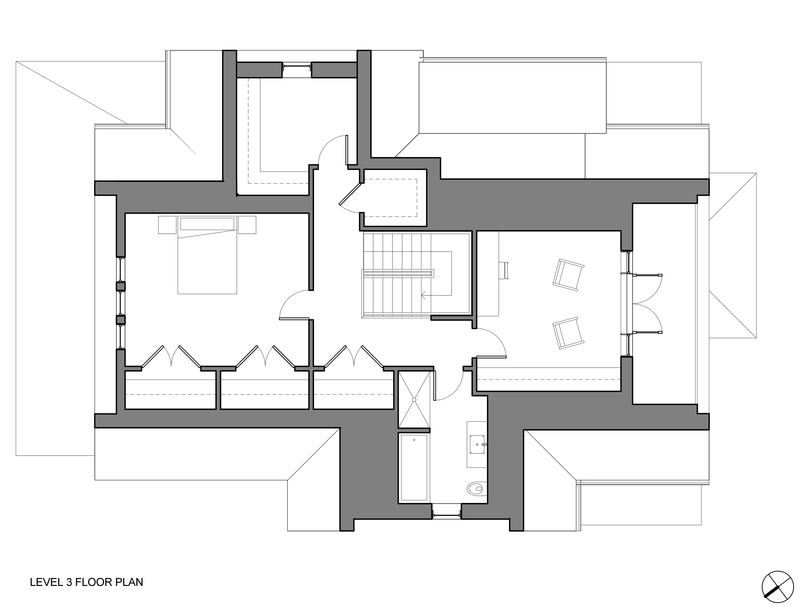 Although it had long been used as a single-family home before our clients moved in, its layout was cumbersome and oppressive, with dead-ends, multiple staircases, and circuitous routes throughout the house. The interior was completely gutted and a central U-shaped staircase was installed in the centre of the home. 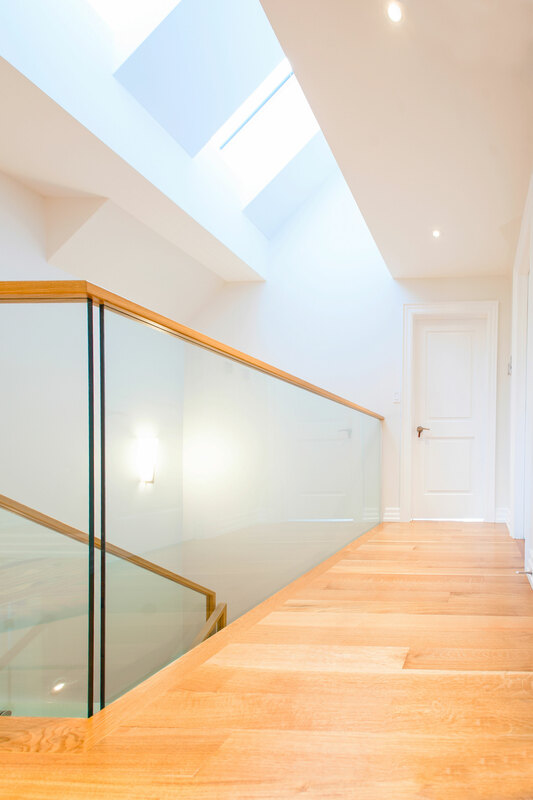 Two large skylights were placed at the top of the stair to bring light down into the heart of the home’s interior. 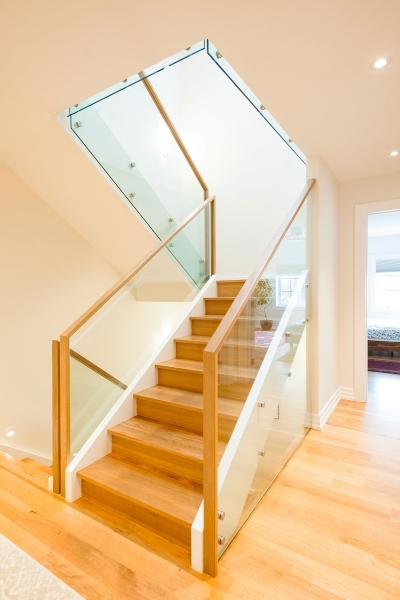 Our clients wanted the option of installing an elevator in the future, so an elevator shaft was constructed directly beside the staircase, ready for an elevator to be installed when necessary. 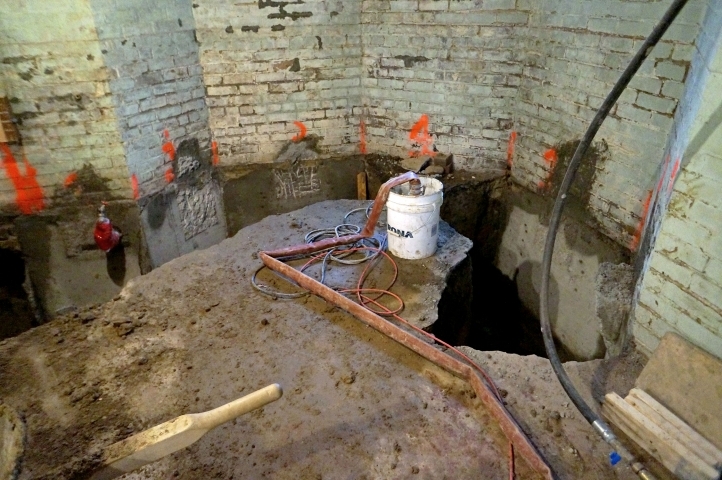 The shaft was then covered on each level with temporary flooring and outfitted as additional storage space on each level. 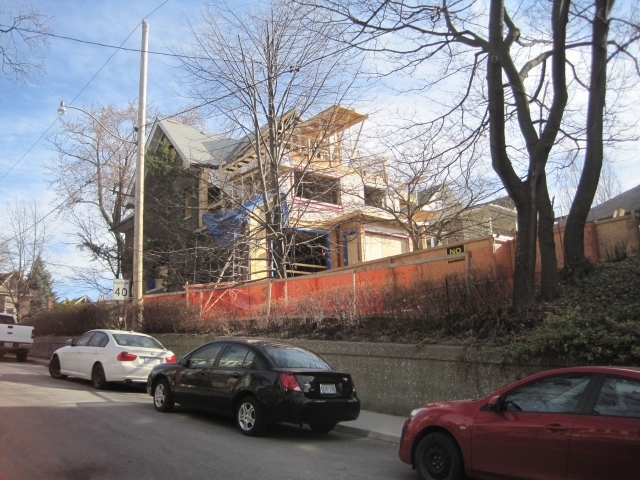 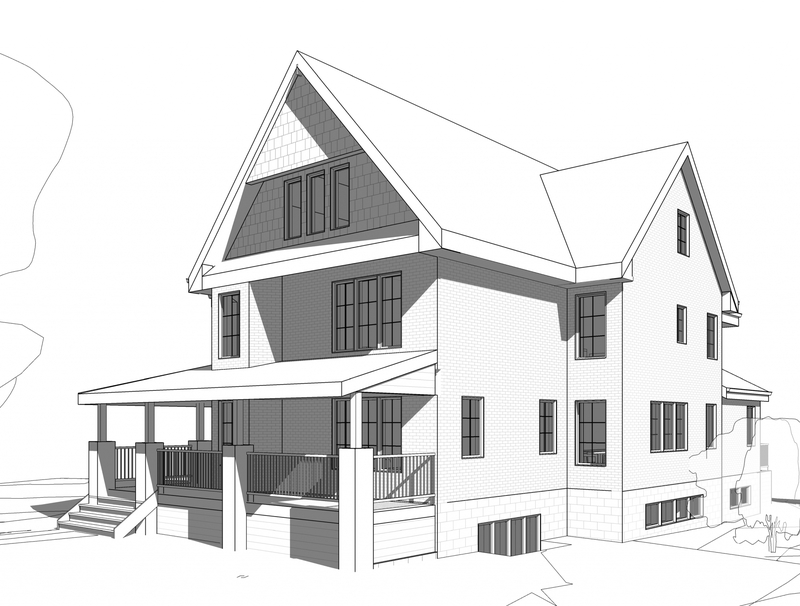 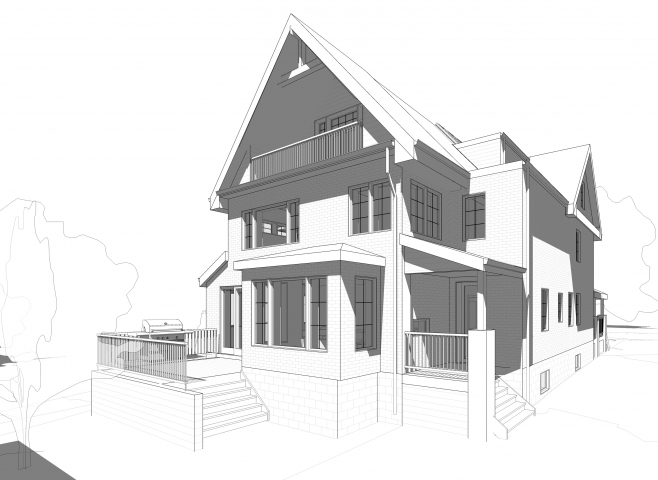 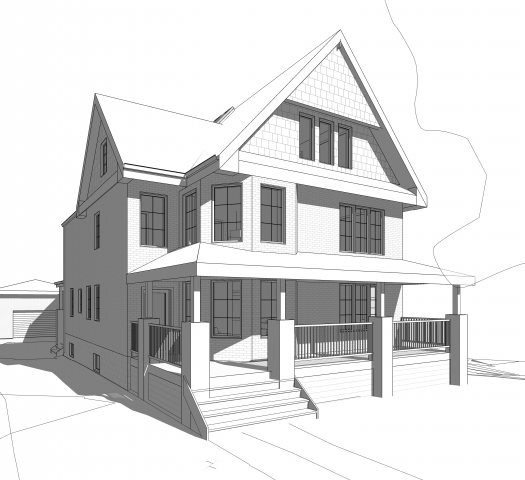 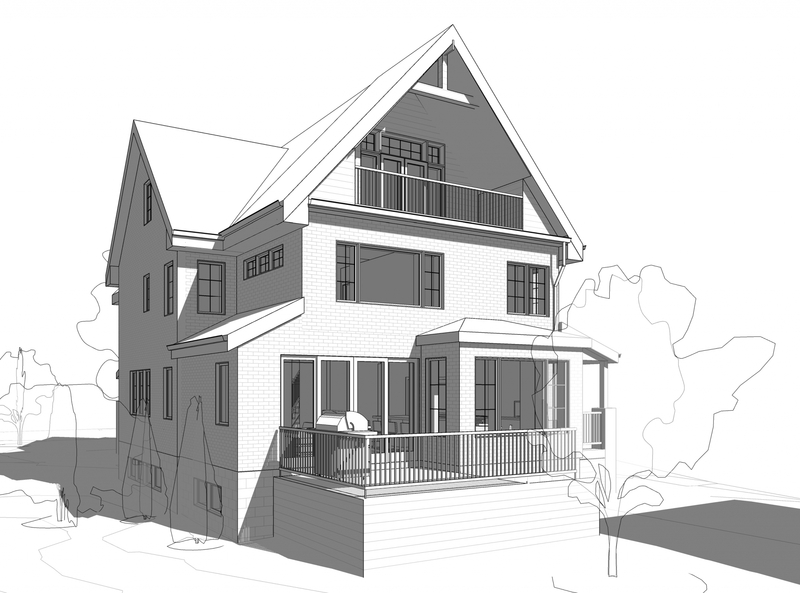 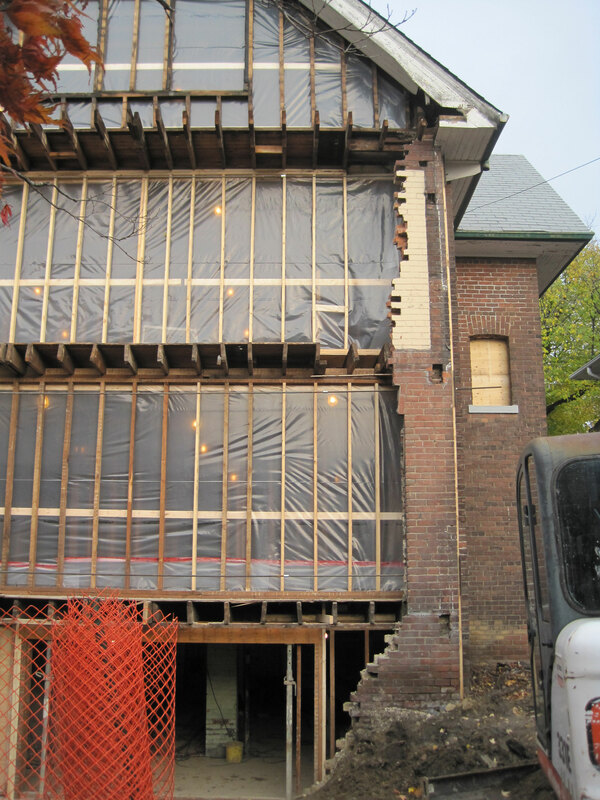 As well, three existing rear additions, that had been added over the years, were removed and replaced with one large addition that spans the main, second, and third floors. A technical challenge of this project was achieving an air-tight, well-insulated envelope without the use of spray foam. 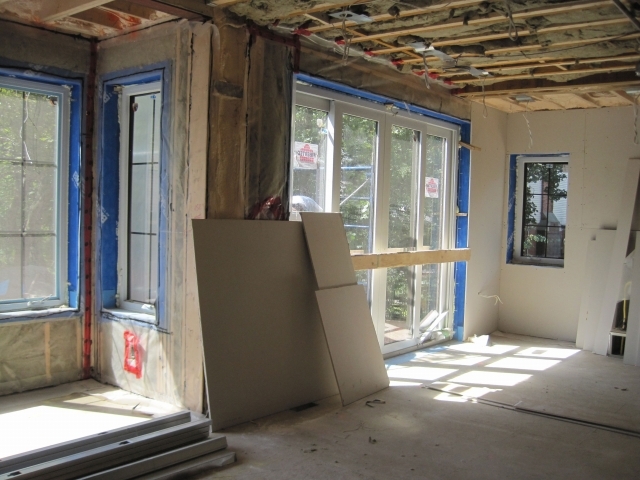 While spray foam can be seen as an energy efficient retrofit solution (as it acts as an air barrier, insulation and a vapour barrier all in one product), many types have significant environmental impact associated with their manufacturing and installation. 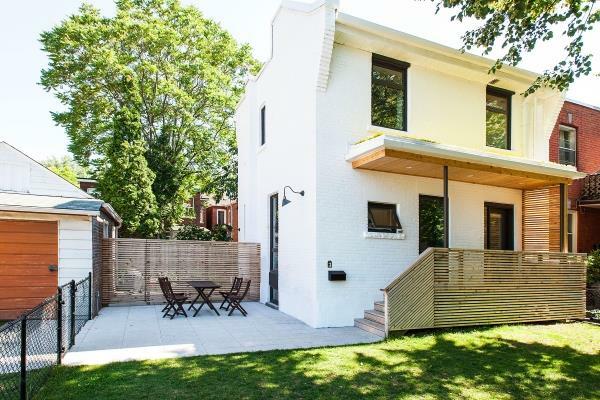 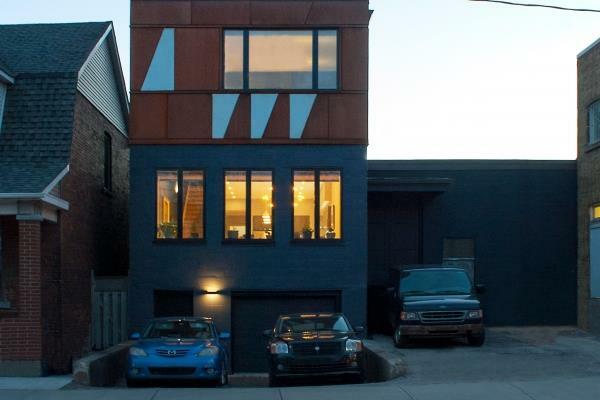 Instead of spray foam, this project uses a new, avant-garde alternative as its air barrier: a rubberized, liquid-applied, vapour-permeable membrane by Henry Bakor, which is applied to the interior face of the house’s load-bearing brick. 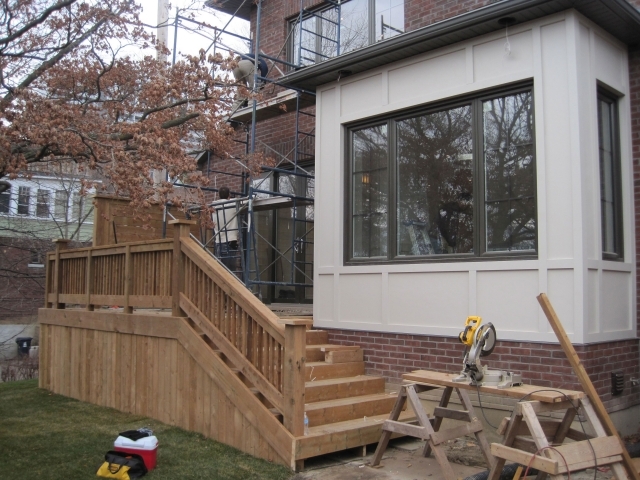 This creates a continuous barrier that can be tested and modified before the house is finished, resulting in superior efficiency and interior comfort. 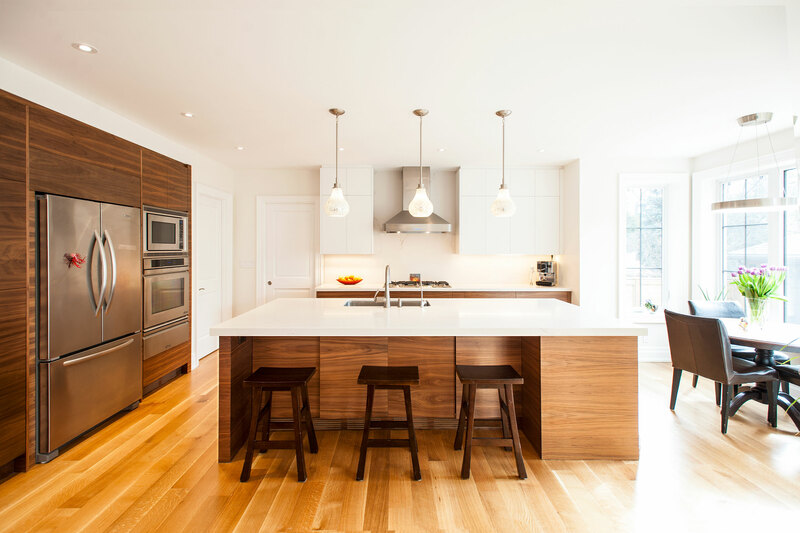 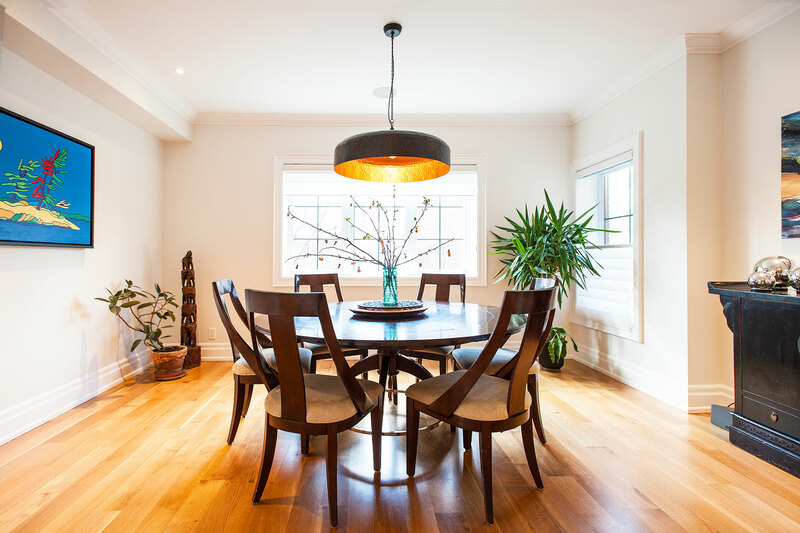 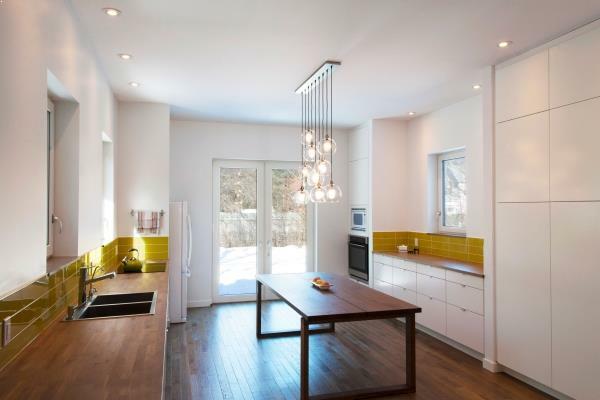 The finished home is a merging of contemporary and traditional aesthetics, with a mix of both formal, traditional rooms and casual, contemporary open-concept spaces. 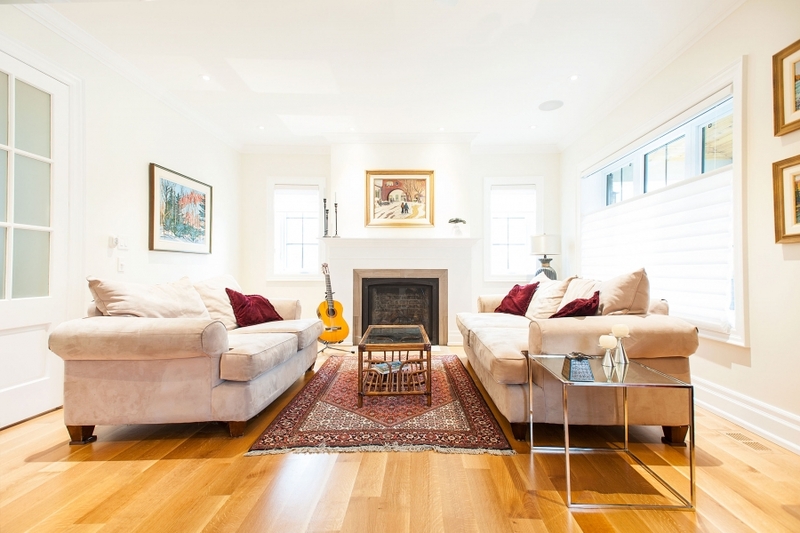 The house’s three floors and large basement offer more than enough space for the family of four to enjoy for generations to come. 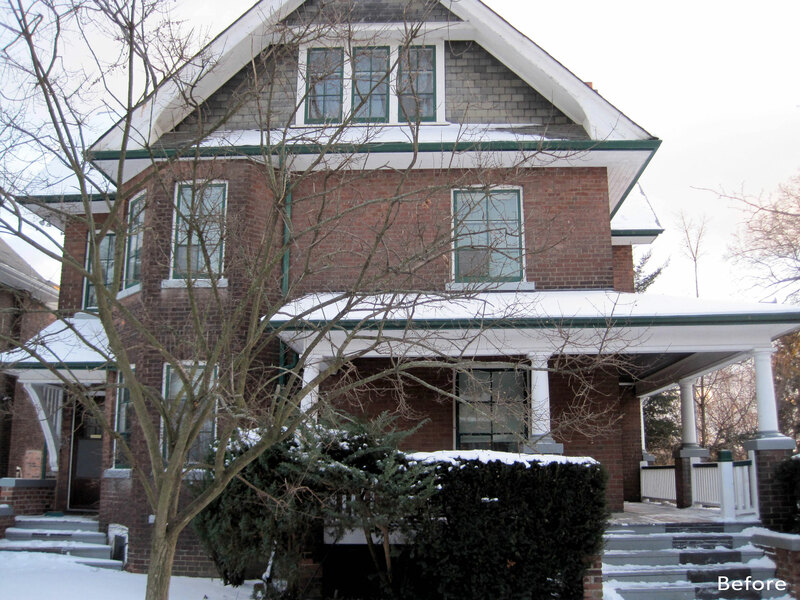 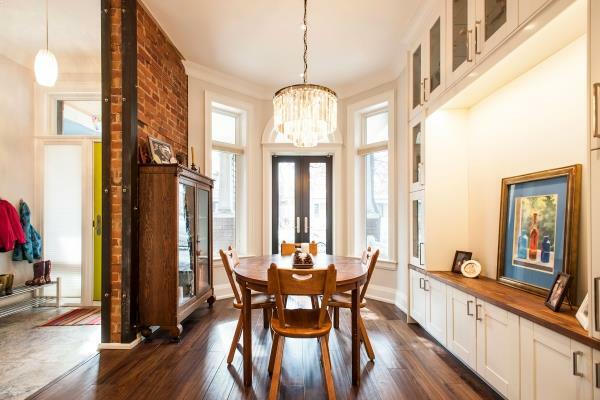 The house stands three storeys tall, plus a spacious finished basement. 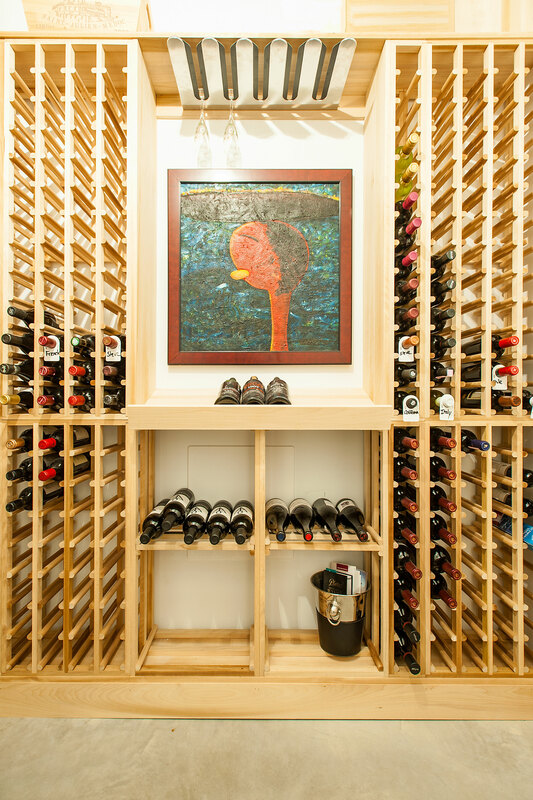 The basement was underpinned to create 9 ft. ceilings, and is large enough to include a TV/playroom for the kids, a bathroom, a wine cellar, an in-home gym, storage and mechanical spaces, and a separate guest suite, with its own bedroom, bathroom, and kitchenette. 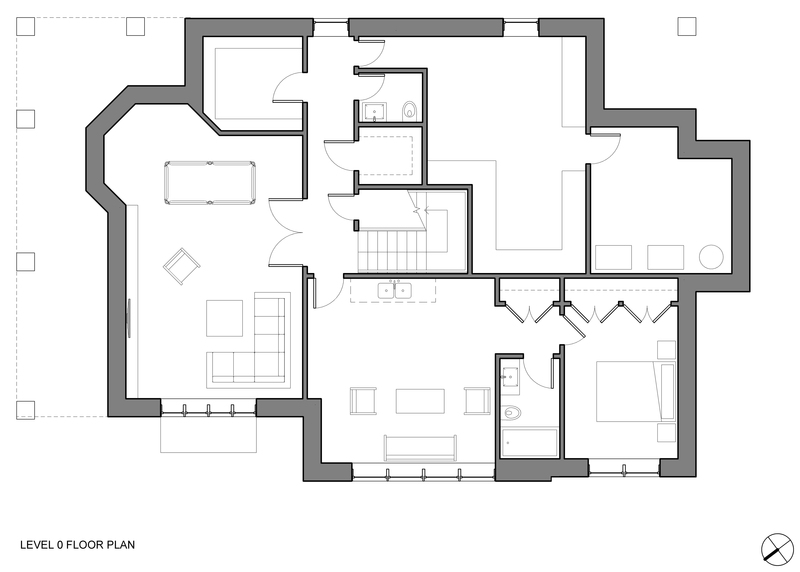 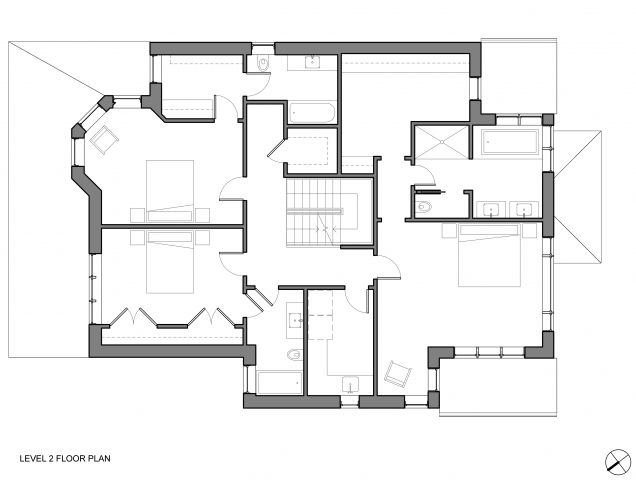 On the first floor, a small powder room and two closets adjoin the front foyer. 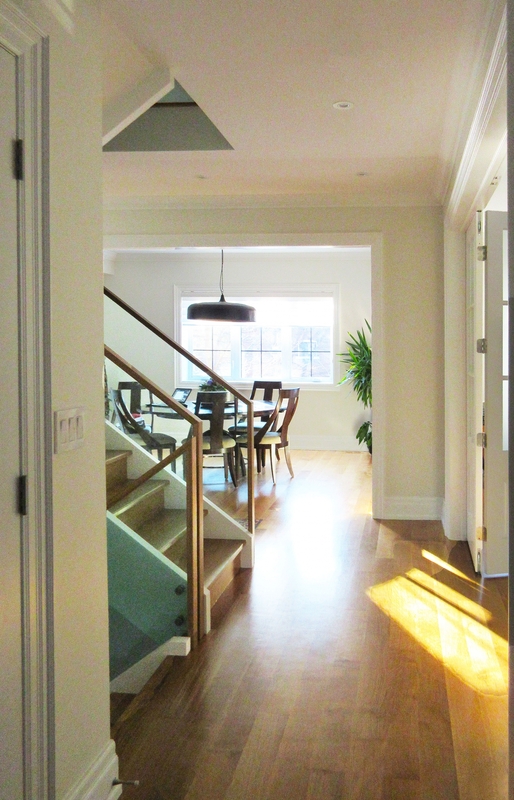 A formal living room takes up the front end of the house, and a formal dining room stands next to the central staircase to the west. 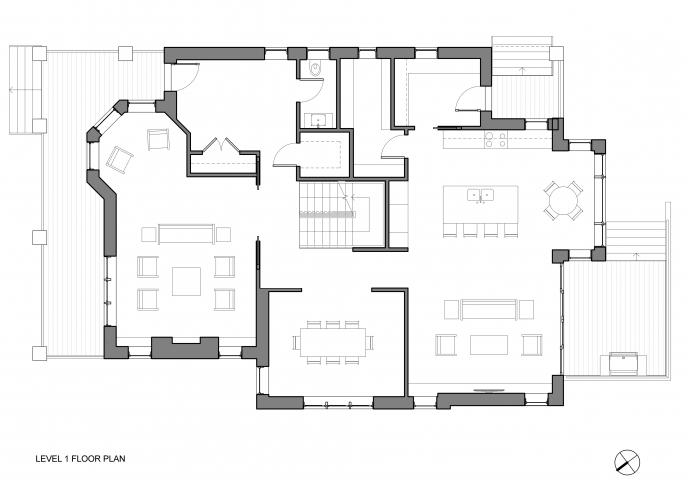 Beyond the formal living room and central stair, the Great Room stretches out along the southern end of the house, made up of a large kitchen with an island/breakfast bar, a nook for casual meals, and a large living area. 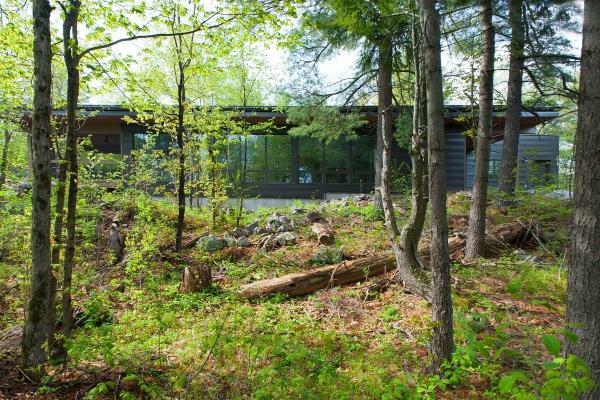 Beyond the living area, a large outdoor deck stretches across the southern end of the house, overlooking the home’s spacious backyard. 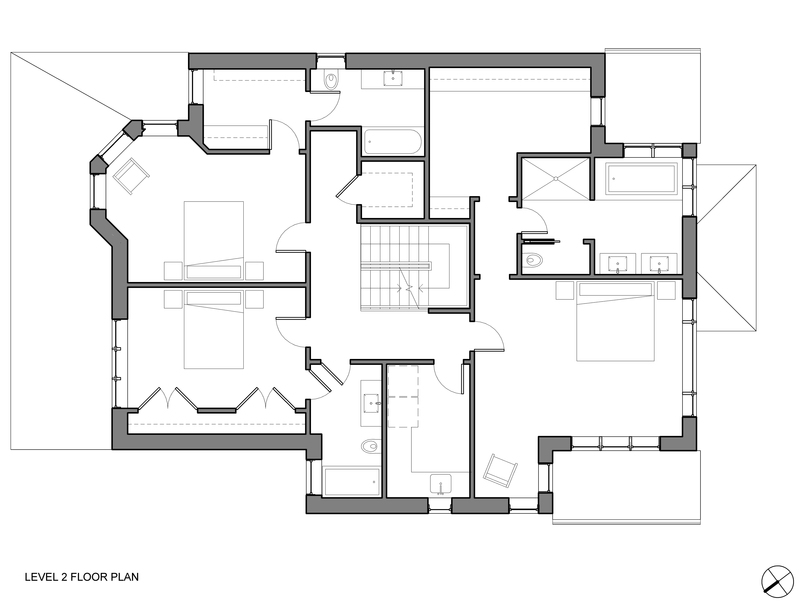 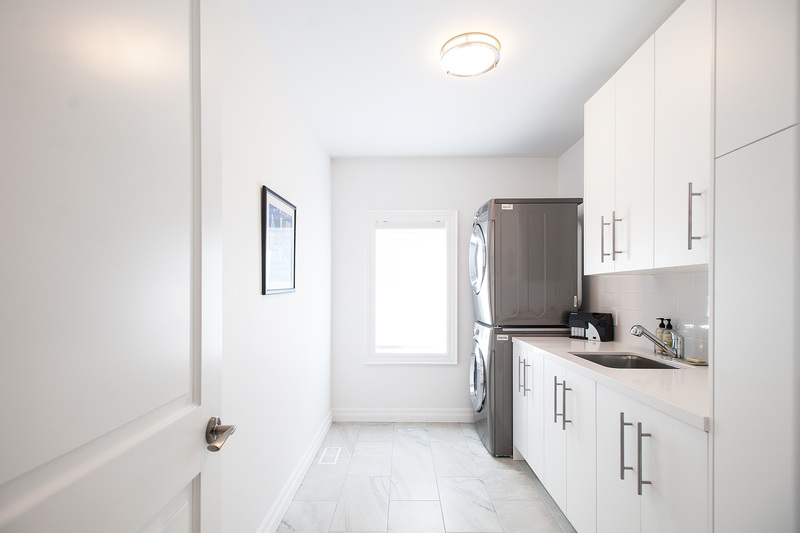 The second floor consists of three bedrooms – all with their own ensuite bathrooms – and a large laundry room. 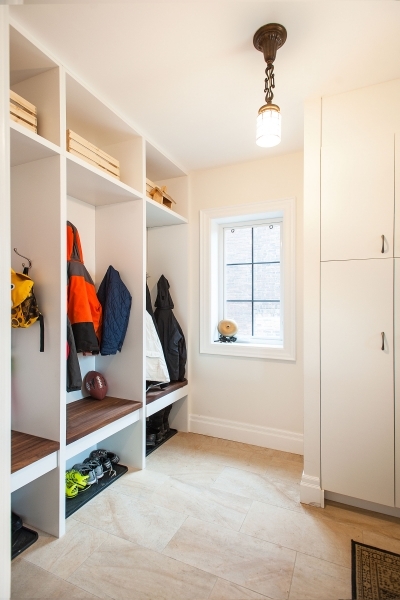 There are walk-in closets in one of the children’s rooms, as well as in the master bedroom, and the master bedroom’s ensuite bathroom includes a shower, bathtub, and double sink vanity. 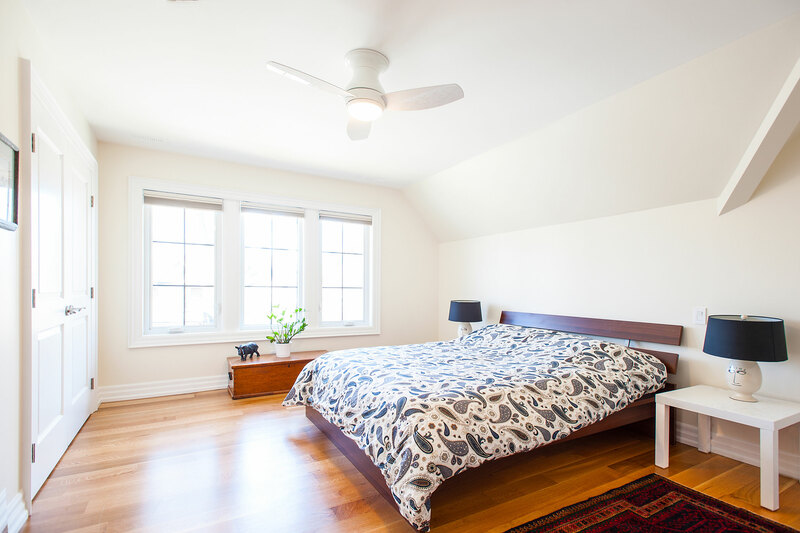 A guest bedroom is located on the third floor, with a large office, lots of closet space, and a large bathroom. 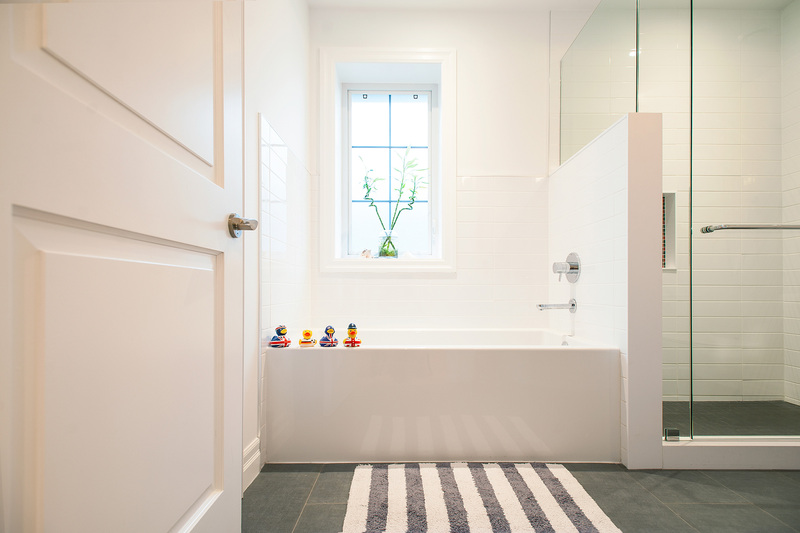 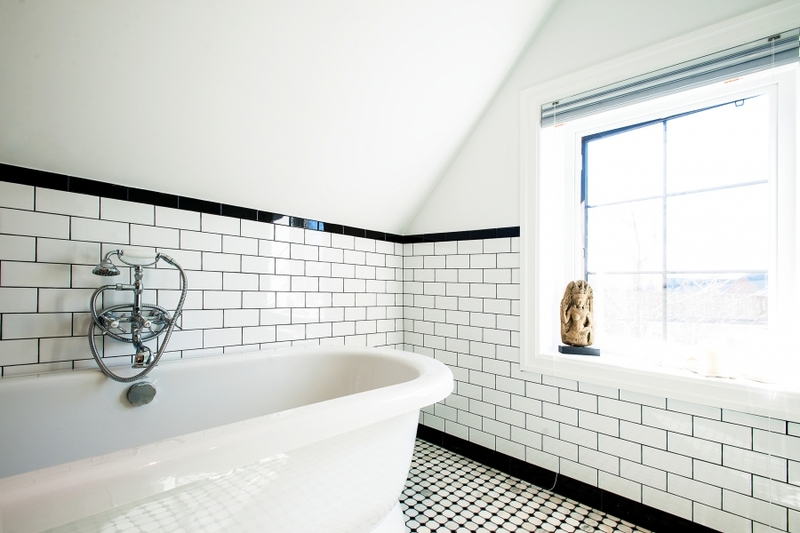 This bathroom is a prominent feature of the house: with black and white checkered tiles, a porcelain freestanding tub and sink, and gleaming chrome hardware, it looks like it was taken straight out of the past. Off the office, a third floor balcony perches over the backyard. 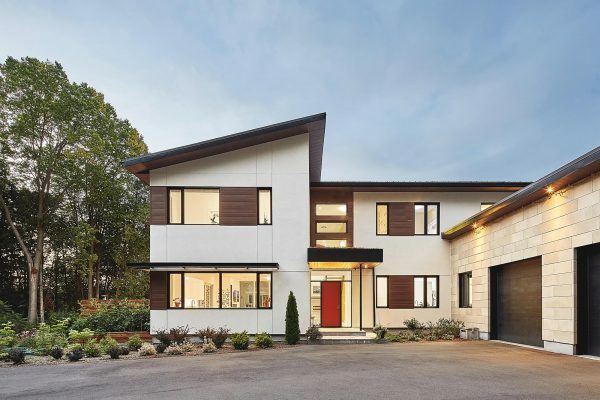 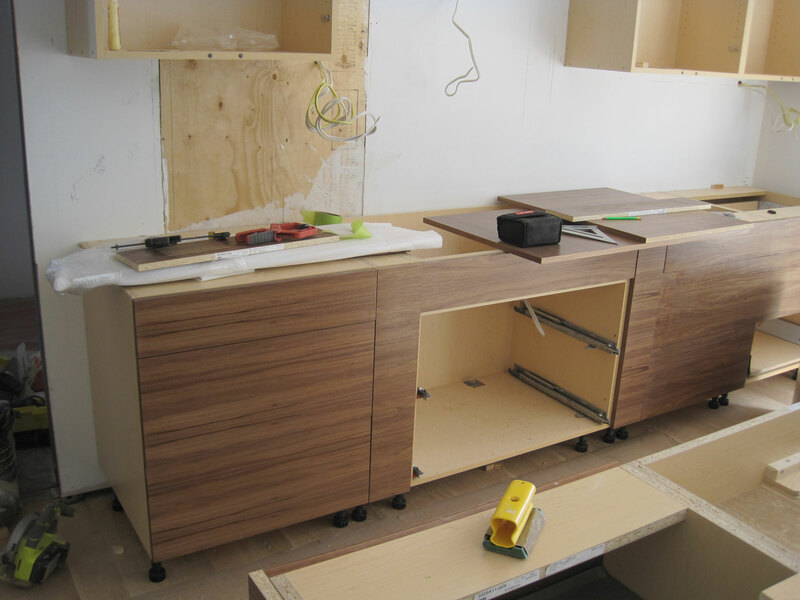 Our builder, Equinox Developments, did a wonderful job on this project. Our site supervisor Ed Kucab and project manager Susan Hunter ensured construction was efficient and timely, even throughout difficult building challenges such as removing the structure’s entire back wall. 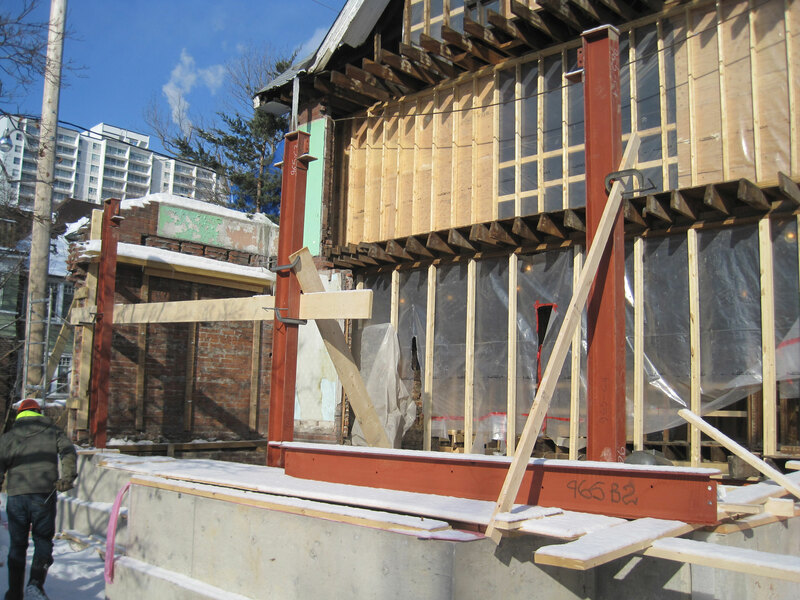 With the back wall removed, Equinox reinforced the structure with steel rods that ran along the width of the house on all three levels. The steel rods were then replaced with a steel moment frame, a large frame made of ultra-durable steel, which allows the rear wall to be comprised almost entirely of non-load bearing windows and doors without compromising the building’s structural integrity. 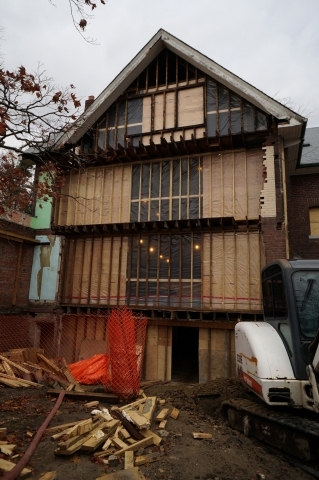 In order to allow for basement ceiling heights of 9 ft., which is 3 ft. higher than the previous basement ceilings, the basement was excavated to lower the floor by 4 ft., which also allowed for 4 in. of gravel and waterproofing, 4 in. of insulation, and a new 4 in.-thick concrete floor slab. 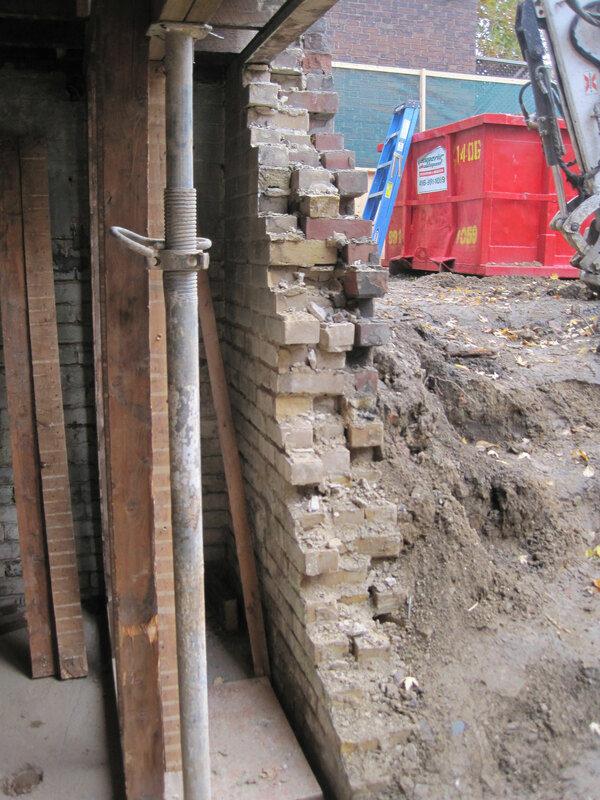 The basement was underpinned using the keyhole method, also used in Our House. We then “sistered” all of the structure’s existing floor joists (which means attaching a brand new member to every existing floor joist) to reinforce and level the floors. 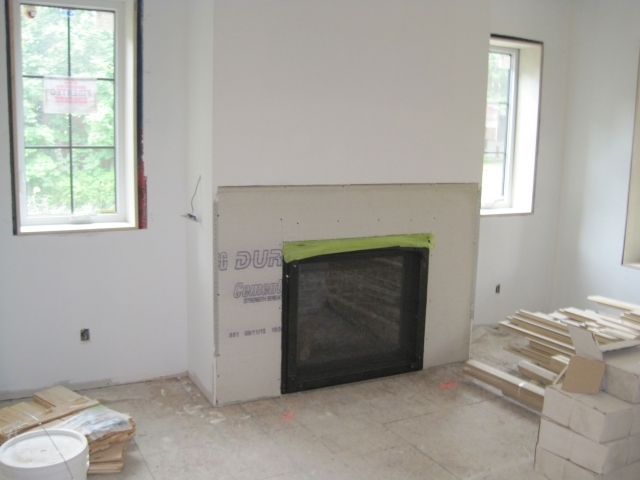 Our clients were adamant that we avoid the use of spray foam, which we adhered to as best as possible. 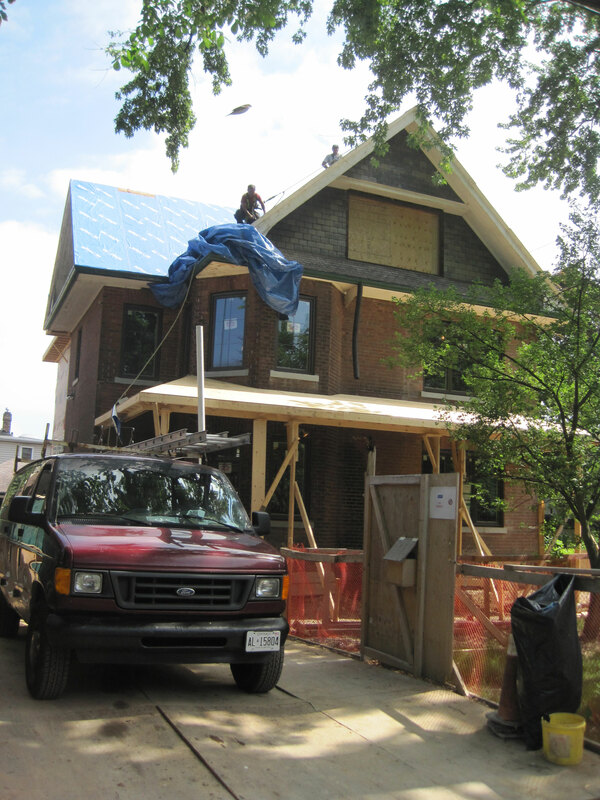 Our air barrier is a vapour-open membrane from Henry Bakor called Blueskin VP100, which was applied in sheets on the interior surface of the structure’s load-bearing brick. Our insulation is 3 in. of semi-rigid Roxul comfort boards, nailed into the brick, followed by 3½ in. 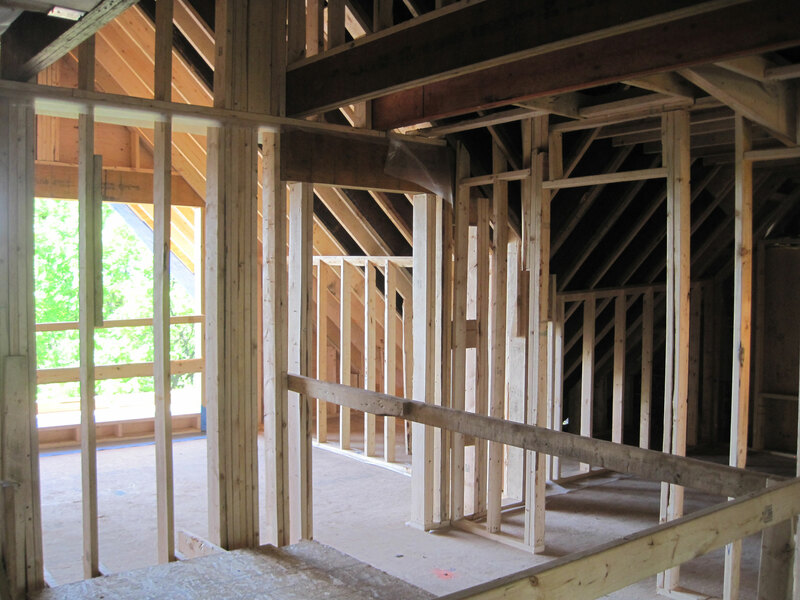 of Roxul batt between studs. 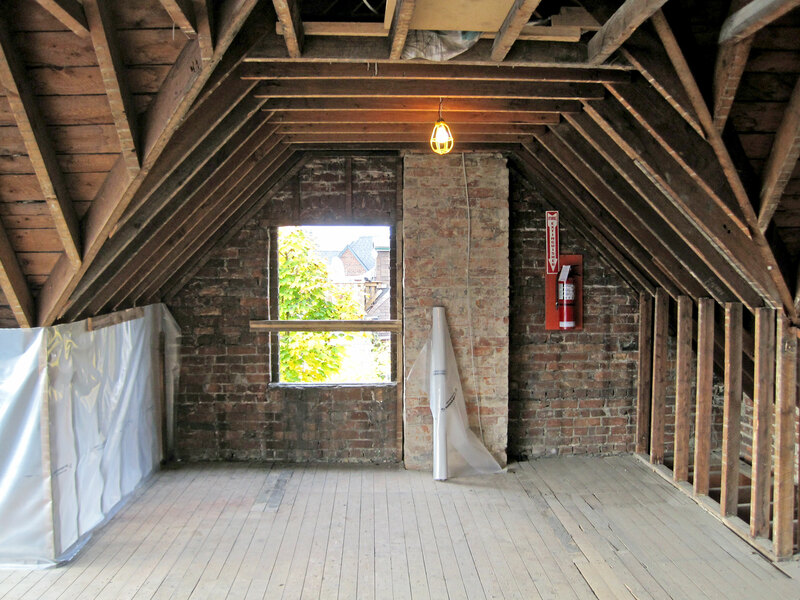 Our initial roof design was the same assembly as our walls, but due to building code restrictions, it was not approved by the building permit office. Applying for official approval to deviate from building code can be hugely time consuming and costly, so our clients did allow for 8 in. of spray foam to be applied on the roof. The windows are double-glazed fiberglass frame windows from Fibertec. 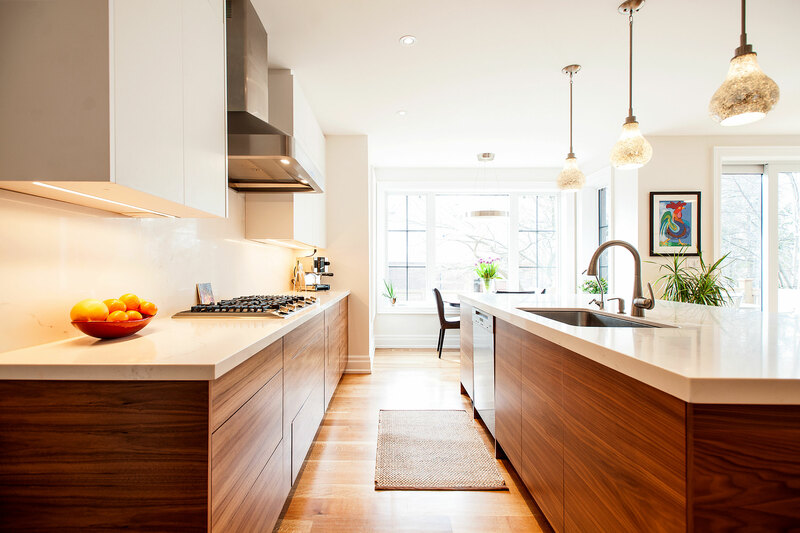 Low-VOC and formaldehyde-free materials were used whenever possible for the home’s interiors.